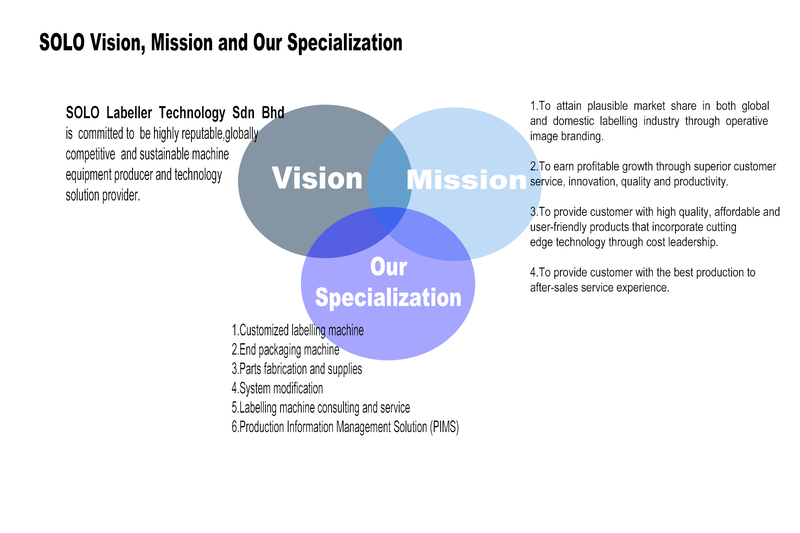 SOLO LABELLER® TECHNOLOGY SDN BHD, one of malaysia largest manufacturer and supplier of standard and customized labelling machine, we provide machine system solution, technology and services merging with extensive research and development. SOLO having developed advanced and customized labelling for high-growth industries such as pharmaceutical, food & beverages, confectionery, chemical as well as those offering professional packaging services, we offer complete produce-on-demand and consulting services. We are further driving innovations for more sustainable industrial automation and durable robotic tecnology. Customer's satisfactions are always our prioritization. We work closely with our strategic business partners, which some of them are Mitsubishi, Sato, Festo, Panasonic, Oriental, Keyence, Di-soric, and many more to provide outstanding service for our valued customers. Our products have been exported to over South East Asia (SEA) countries, and we constantly learn from our intensive research and development to exceed beyond expectations and fulfil our mission to deliver high quality products and superior services with cost leadership. SOLO has complete equipment, strong technical capacity, structured enterprise management and high production efficiency. We are ready to offer the best service for you.